The top of the range Hi-Fi system of the time. Originally, it comprised Beomaster 8000, complete with a “Beolab Terminal” remote control, Beogram 8000 (with and MMC 20 CL pickup), Beocord 8000 cassette deck and a pair of Beovox MS 150 loudspeakers. The SC 80 system cabinet completed the system. Text copyright © Beocentral. Unauthorised reproduction prohibited. The system evolved as the various components were updated. The cassette deck changed from the Beocord 8000 to the Beocord 8002 when HX Pro was added, and again to Beocord 8004 when Dolby C was added. Beocord 9000 could also be used as part of Beolab 8000. The turntable was changed too, to the Beogram 8002 (with MMC 1 pickup). The Beomaster 8000 itself though was never altered. 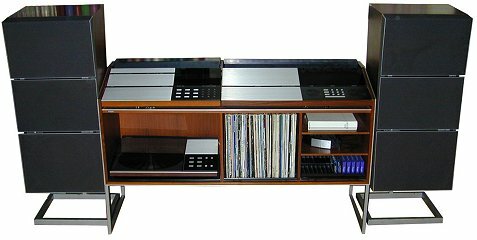 Finally, the SC 80 cabinet was supplemented by the SC 80-2 “System module”, a similar piece of furniture but in a more modern style. Text copyright © Beocentral. Unauthorised reproduction prohibited. Additions to the Beolab 8000 were few, an extra pair of loudspeakers could be connected, as could a second cassette deck. Text copyright © Beocentral. Unauthorised reproduction prohibited.